CHICAGO—If you’re interested in Chicago, read this book. If you’re interested in politics, read this book. If you’re interested in the more-than-occasional zaniness of Chicago politics, read this book. And if you’re interested in Barack Obama – his strengths and his weaknesses – read this book. 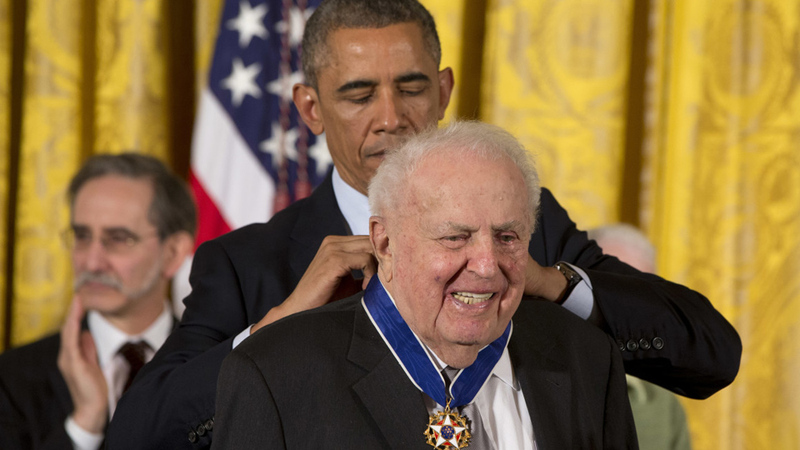 “This book” is Conversations with Abner Mikva by Sandy Horwitt. Horwitt was the longtime friend, aide, speechwriter and a few other roles for Mikva, the former – in this order – pro-worker labor lawyer, state legislator, congressman from Chicago and then from its northern and northwestern suburbs, federal appeals court judge and finally White House counsel for Bill Clinton. And, in the final years of Ab’s life, Horwitt was his conversational partner. 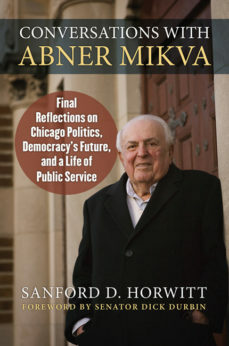 Mikva, who died at age 90 on Independence Day 2016, spent his final years still active and engaged in Chicago, its politics and civic affairs, winding up with handling arbitrations and teaching public interest law at his old law school at the University of Chicago. Ab and his wife Zoe also set up a foundation, The Mikva Challenge, for civic education of inner-city youths in public service. It’s in the book, too. 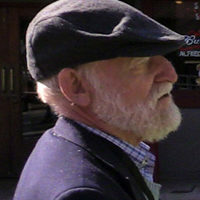 But the longtime Hyde Park and Evanston resident, who retired to the North Side, also spent his time in talks about Chicago, politics, its changes and its tensions, and about aging, with Horwitt. Excerpts of their talks are the heart of the book. And, by the way, everybody called Mikva Ab, so we will, too. Horwitt’s book captures not just Ab’s wit, wisdom, quips and stories, but also what drew people to him, even when they weren’t interested in, or were turned off by, politics. Their topics range from Chicago Mayor Richard J. Daley to Obama, from Ab’s childhood in Milwaukee – a background Horwitt shared – to civil rights. From gun control to congressional reform. And from open housing and opposition to it among the city’s whites to how Daley finessed Martin Luther King. And to what Congress was like in the late 1960s and 1970s compared to what it is now. On that, in a few words, telescoping a longer talk with Horwitt, Ab hated what Congress had become, and he would not run or serve in the modern era. That’s because Ab, like many of his colleagues who came to Congress then, came because they – and modern readers will find this hard to believe – were in a way, idealists. Regardless of political party, they truly believed that by arguing out differences and working together when possible, they could accomplish something for the country. That’s lacking now, Ab told Horwitt. But Ab also brought his brains and became a valued vote-counter for House Speaker Tip O’Neill and an ally of California Democratic bigwig Phil Burton, while always going his own independent way: Standing up for open housing and gun control in a district on the South Side that didn’t like either, steering the 26th Amendment – giving 18-year-olds the right to vote – through the House, and more. There were stumbles, too. Ab admits them. Here’s one: Ab, who was Jewish and a civil liberties advocate, equivocated on the Nazi march through heavily Jewish Skokie, which was in his later North Shore suburban district. The ACLU’s defense of the Nazis split it down the middle, in Illinois and nationally. But Ab also brings his analysis and wit to everything from the Supreme Court’s Citizens United ruling – one of the worst, he says, if not the worst, of the last 50 years – to the foibles of the Illinois legislature, the U.S. House and the Clinton White House. And when a young community organizer named Barack Obama started pondering a political career, Ab was his mentor. Ab recognized Obama’s brains, his ability to fire up people, his soaring rhetoric, his success in adapting Saul Alinsky’s community organizing tactics to politics, and his conviction, common among progressives, that the logical strength of the issues they advocate is enough to win. It often isn’t, as Ab learned in the Illinois legislature. At the end, and this picture’s in the book, Obama is awarding the Medal of Freedom, the nation’s highest civilian honor, to Ab. By contrast, Hillary Clinton, whom Ab knew when he served, for just over a year, as White House counsel, was a great policy wonk, but not a good politician – or at least that’s the impression I got. At this point, let this reviewer enter a BIG disclaimer. Yours truly first met Ab when I was, no kidding, in elementary school. My father covered Ab in Chicago, in the state legislature and, later, in Congress for the late and lamented Chicago Daily News. Even after Dad died, we kept in touch off and on. There were many times Ab sat on our living room couch trading stories and political observations with Bob Gruenberg, with the rest of us as interested spectators and questioners. The two became something more than reporter and news source. They became friends, so much so that I remember Dad telling Ab that he had to bend over backwards not to cover him. Dad said if he covered only Illinois lawmakers who made a difference, the stories would have been mostly quoting Ab, the two senators, House Minority Leader Bob Michel of Peoria, and, of course, “Rosty,” Rep. Dan Rostenkowski of the Northwest Side, Mayor Daley’s man in D.C., and chair of the powerful Ways and Means Committee. Ab is more generous about his colleagues. But to give you an idea of the flavor of the stories, let me paraphrase a few, starting with one that tells something about the zaniness – and humor – of Illinois politics. Those of us who follow the state closely know well that Mayor Daley – “The Mayor” as we all call him – couldn’t stand Ab. Ab was an independent, not a Machine man. He represented the university community of Hyde Park, where he lived, and the far Southeast Side of Chicago for his first two terms on Capitol Hill, 1969-73, until Daley got state lawmakers to redistrict Ab out of his House seat. So Ab moved to Evanston, as did many other former Jewish residents of Hyde Park and South Shore, and ran in 1972 for a new open seat in a leaning-Republican 10th District covering Evanston, Skokie and more conservative Republican northern and western suburbs. Ab lost narrowly to GOP nominee Sam Young and beat Young in a 1974 rematch by 2,860 votes out of just over 164,000 cast. That was a landslide compared to 1976, when Ab won the last race he had with Young by – and we all remember this – 201 votes. Out of 213,414 cast. Meanwhile, Gerald Ford beat Jimmy Carter by 21 percentage points in the 10th. Who says every vote doesn’t count? But Ab’s 1974 win pissed off both Rosty and The Mayor, who tried to redistrict Ab out of his chair a second time, in 1975. Daley also wanted a new open seat for his own son, Richard M. “Richie” Daley. Well, you need a 60 percent supermajority in the Illinois legislature — 89 votes in the House — to pass redistricting plans, and The Mayor had 85. The way Ab told the story to Horwitt, “Clyde Choate,” an influential downstate Democrat, “and three downstate buddies were having dinner at a nearby restaurant” in the state capital of Springfield. They hadn’t voted, yet. Then there’s the story of how Ab got onto the U.S. Circuit Court of Appeals for D.C. in 1979. It sort of sounds like a Tinker-to-Evers-to-Chance double play. Except the double-play combo went Ab to Teddy Kennedy to Orrin Hatch – who went to Strom Thurmond, whom Hatch and Ab convinced to hold Ab’s judicial confirmation hearing in time for Ab to beat a legal deadline and get on the court. Despite, I might add, an expensive and vitriolic anti-Ab campaign by the National Rifle Association. Or the story about how The Mayor finessed Dr. King by setting up a sham “open housing” committee chaired by the city’s leading developer – who was responsible for much of Chicago’s white flight and blockbusting. Which led Ab to point out Chicago was not the city that worked for blacks and browns. There are also a lot of interesting observations by Ab, and Horwitt, about Chicago, the South Side, city politics, national politics, what it was like to work in – and how frustrating it was to work for – Bill Clinton and even politics on the court. All of which makes for great storytelling, with a point, too. • Ab ran his 1968 congressional campaign as an anti-war advocate in a district that was split on Vietnam: Hyde Park against, Southeast Side for, in general terms. There’s a short segment about Vietnam and the anti-war protesters at the infamous 1968 Democratic National Convention in Chicago. I would have liked to have read a little more about how Ab explained all that in his district – and about Ab’s reaction seven years later when a special Senate committee revealed the CIA engaged in domestic spying against anti-war federal legislators, including Ab and Sen. Adlai Stevenson III. Yet Ab, who started in politics as a volunteer in 1948, is virtually the only notable Chicago political figure — apart from The Mayor’s sons John, Bill and Richie — whose career spanned the complete mayoral tenures of both The Mayor (1955-76) and Richie (1989-2011). I would have loved to read Ab’s comparison of the two. Not to Ab mention discussing some other notable Chicago political personalities. That especially includes Chicagoans who were part of King’s open housing campaign, such as Jesse Jackson Sr. and Al Raby – and its foes besides The Mayor. • And maybe Horwitt had to omit this story, but my father once asked Ab about his greatest political disappointment. Ab’s answer was the 1972 loss to Young, but not for standard reasons you’re thinking. Ab, you see, sat on the House Judiciary Committee. Had he won in 1972, he would have stayed on. And we all know what that committee spent 1973-74 doing: Investigating, and then impeaching, Richard Nixon. Ab was frustrated that he missed that. If you want an idea of the role Ab would have played, remember the brains and “specificity” of Rep. Paul Sarbanes, D-Md. 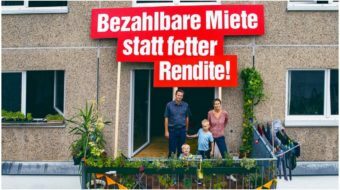 – and add a sense of humor.